Give them a small space and some mehndi cones; and let their expertise do all the magic. Whether it’s curious glances, constant stares, comments or lots and lots of admiration surrounding them, nothing can break their concentration while they’re busy beautifying the palms of women. Yes, we are talking about mehendi designers wihtout whom your bridal look is incomplete. Mehendi designers are one talented breed and ther is no denying the fact that one cannot match the designs that they come up with. Initially only limited to weddings and karva chauth, women have now extended their excuse to smear on that henna during other functions, such as baby showers, rakhsha bandhan and even birthday parties. A brides solah shringar is incomplete without mehndi and these artists completely understand this phenomena, which challenges them to offer something unique in designs ensuring its trendy yet traditional. The neatness and precision is what makes each mehndi designer stand out from the rest. Bangloreans lead a busy life, ditto for brides-to-be too. So, to make things easier for you, we’ve summed up a list of 7 best mehndi artists in Bangalore who’re taking the henna artistry world by storm. Always staying abreast with the latest trends in mehndi, we have Mubaraka Maimoon first on our list of 7 best mehndi artists in Bangalore. Her artistic touches to the bridal mehndi have won many hearts, which make her the most in-demand artist for all functions. The intricacies and preciseness of her work are mind-blowing. For the most unique mehndi designs in Bangalore, she is your go-to person. Well-Known For: Using 100% fresh and natural henna powder that is blended with eucalyptus essential oil. One of the most sought-after freelancing mehndi artists in Bangalore, Pushpa Mehndi Arts has been beautifying brides for over 10 years. Its team of 10 skilled mehndi designers are available for all sorts of functions. From modern to traditional, they have a plethora of gorgeous designs that could easily get you confused about which one would look the best on you. But you can trust their judgement on what will suit your bridal attire. The best part about them is you can book an appointment with them for design selections and get a free demo of their work on the top of your hand and palm. For door-step services, Sanki Mehendi Design, which is run by Sangeetha, doesn’t fail to impress. Offering designs with such fine detailing, this mehendi designer showcases art that is simply astounding and will leave you breathless (not completely, but for a few seconds for sure). Run by Shruthi Reddy, Kalanyasa is a team of friendly mehndi artists in Bangalore who have worked on over 500 weddings, which has given them exposure to all types of mehndi designs. Whether it’s Arabic, Indo-Arabic or traditional henna design that you want, Kalanyasa adds a modern touch to all styles, giving it a fresh look. From dainty intricate designs to elaborate figurative motifs, Mahek Mehendi Design knows what works well to enhance a bride’s beauty. With over 16 years of experience in the business, they create all types of henna designs like magic! Making his mark in an industry ruled by women, we have Raghunandan, one of the best mehndi designers in Bangalore. Owner of Renuka Bridal Creations, Raghunandan offers the most contemporary styles in mehndi that are to die for. Whether it’s a replication of an existing design or your need for something unique, Raghunandan offers sheer brilliance. Need a strong individual style or a combination of various mehndi designs? Here’s Shubh Muhurat Mehendi Artist who offers highly personalised and bespoke services. Always updated with the latest trends in their field, they leave no stone unturned or should we say no cone unused to ensure your bridal mehndi looks as attractive and gorgeous as you. Request for a fusion design and watch them combine India, Arabic and Moghul mehndi designs. They’ll come up with a creation that’s simply out of this world. 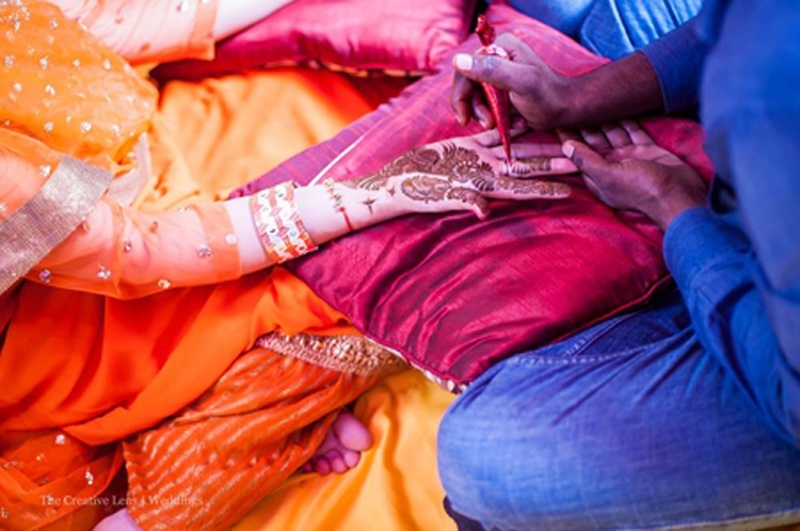 Among these 7 best mehndi artists of Bangalore, we hope you find your match for the big day. You can book them online here.